Here is the final Known World Map. I love the map. 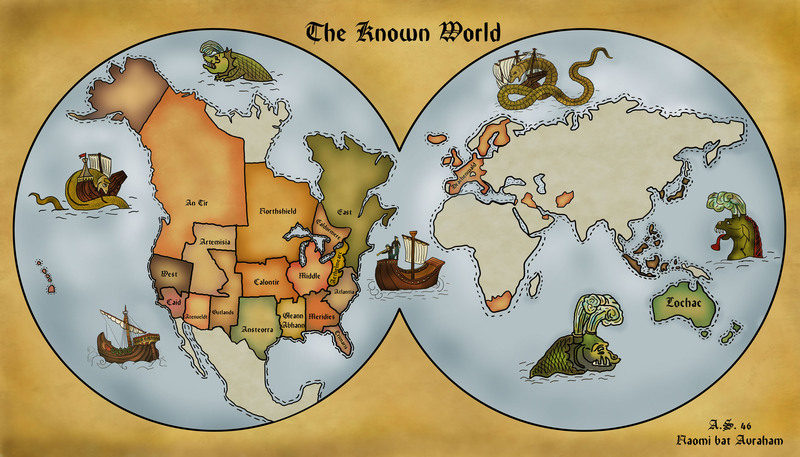 It’s one of the best depictions of the Known World I’ve seen in a long time. I am so glad that you like it! I actually had prints made of it. They are full color and about 11″x17″ on card stock. Email me at naomiATblastedoak.com and we can work out the details of getting you a copy. I’d like to use it as an icon for the new SCA IKA Facebook community I’m setting up. Do I have permission? By far the best world map I’ve seen! would you mind if I put this on my households website? I apologize for bad English. It is not my first language. We are a small SCA group located in Bangkok, Thailand where most of our members don’t even speak English. I have been trying to get the locals here connected to the Known world. I want them to know that the SCA is a world wide thing and there are people like us out there. I really love the map you created here and really hope that one day, you could also highlight THAILAND to be under the West as well. And if that is done, with your permission, please allow us to print this map out in big full color so we can teach people in Thailand where the SCAs are and where we are. Look forward to hear your approval. And Hawaii is part of Caid. Thank you very much! I’m glad you like the map. Hawaii is marked as part of Caid in the map, its kinda hard to see the colors in the thumbnail. Unfortunately, I decided not to add Antarctica to the map, due to space. The new version of the map will have Thailand. I was wondering if you happen to have a high res scan of this. I would love to have it printed as a poster and added to my living room decor which inludes several vintage looking world maps because my two sons go to school online from my living room. We are trying to make the decor sort of vintage map inspired so they are inspired to learn about the world around the and I think your map fits right in. Besides I’ve been a member both active and casula for 27 years. I am willing to make whatever arrangements you’d like if it is humanly possible. I really love this map, it is beautifully done. 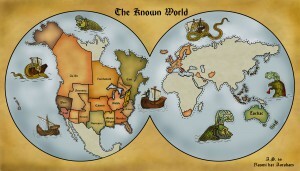 May we use it on our canton’s site to illustrate the Known World, with you credited, naturally. Hi. I am so glad that you like my map. I would be delighted for you to use the map on the website. Just give a link back to my website.